Teachers: Funding Available for School Field Trips! Contact Rebecca Phelps for additional information about these field trip opportunities at the contact information below. We are nearing completion on the primary excavation block where the septic tanks are going to be placed. The excavations for the waterline trench are ongoing, but curiously, artifacts are not nearly as abundant as the excavation block. Quartzite is still the predominant recovered raw material, suggesting a clear and ongoing use of specific raw material resources over time. We are finishing the trench excavation prior to the weekend rush, because it requires us to have a portion of the parking lot closed. Almost no artifacts have been recovered from this latest portion of the trench, suggesting thinning evidence of occupation away from the river. We also recovered what appears to be a spear point dating to the early archaic period, approximately 9,000-7,500 calendar years ago. Abundant artifacts are still being recovered from the primary excavation project. We are extending the 1 x 1 m excavation blocks to the south and to the east. The soil in this area is very thin, both the artifact rich dark layer and the lower soil horizon. Glacially deposited boulders and cobbles were encountered almost immediately. We gave also begun to excavate a trench where the a waterline will run and artifacts are also beginning to appear, although at lower densities thus far. I also just finished a presentation on our ongoing excavations at the state park nature pavilion that was quite well-attended and had an extended Q & A session. Only a short update today. We were rained out for a good portion of the morning after arriving at the site. After the weather cleared and we cleaned the excavation units, we opened up a new series of 1 x 1 m units farther back from the River terrace edge. Several additional Late Woodland projectile points have already been recovered from these newly opened units. As I believe you are aware, I will be giving an informal presentation tomorrow during lunch at the state park. Just a quick update today. We are continuing to excavate the 1 x 1 m units we have open before we leave for the weekend. At the base of excavation, we are encountering basal, glacially deposited cobbles, suggesting that there has been very little soil development in the area since the retreat of the glaciers. Below the black, artifact-rich living surface, artifact counts drop off precipitously. We found the first piece of Native American-made pottery this morning. The distinctive decorative patterns on the outer surface suggest that it was made during the Late Woodland period (1,000-1600 AD). We will be back on Monday! We are trying to finish up existing units before opening new ones. Artifacts, however, are still abundant. We have recovered approximately 15 projectile points (arrowheads or spearpoints). Not only are these artifacts aesthetically nice to recover and give an indication of the activities undertaken by the site occupants, projectile points are important because they are temporally diagnostic. In other words, they can be used to date the occupations at the site. From the projectile points recovered thus far, two time periods are represented. By far, the majority of the projectile points recovered to the late woodland period, or around 1,000-1600 AD. These points seem to be clustered in one area. The other time period is represented by a single projectile point that dates to around 3,000-2,000 years ago. All are invited to a Power Point presentation about the dig so far at Jamaica State Park, 12:00 noon on Tuesday, August 24th. Work is going well...Many more artifacts were recovered. In one, 1 x 1 m test unit, we uncovered what appears to be a fire hearth of some kind surrounded by what appear to be postmolds or the outline of what were once posts in the ground. The pattern does not suggest a particular outline (such as a house pattern or a fish-drying rack) but we are opening up larger, 2 x 2 m blocks in order to try and expose more patterning. 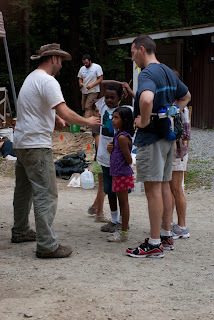 Day One: August 9, 2010: It has been an incredible morning. We have had numerous visitors, and have set up a public information and artifact washing station. Although we only have two, 1 x 1 m excavation blocks open thus far, there are an amazing array of artifacts turning up- including a large amount of flakes from stone tool making, a celt fragment, numerous projectile point (arrow or spear point) fragments and a net sinker. Ancient artifacts found at Jamaica State Park! 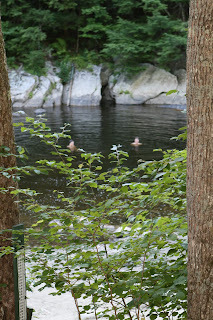 Could Jamaica State Park be one of the oldest campgrounds in Vermont? 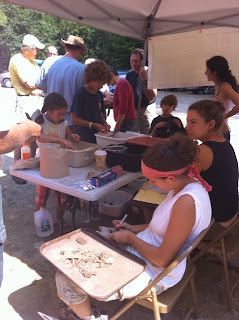 Join us for a real, live archaeological dig in progress! While planning for some waste water system work, a few test pits were dug and 70- 80 ancient artifacts were found near the Salmon Hole at Jamaica State Park, triggering a full blown archaeological dig. In fact, beneath the park lie the remains of numerous ancient Native American camp sites dating back at least 6,000 years. 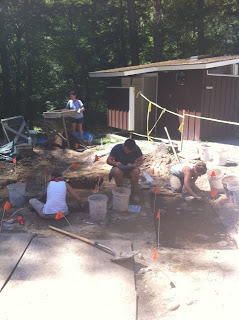 The University of Vermont Consulting Archaeology Program will be excavating portions of a Native American campsite (VT-WD-2), near Salmon Hole in Jamaica State Park on weekdays from August 9 - 20, 2010. This work represents the first systematic excavation of this well known, but poorly understood site, and is being carried out in advance of much needed park facility upgrades. Ice Cream or Salad - Which Would YOU Choose? There are some new, healthy menu items at the concession stands at Silver Lake and Camp Plymouth State Parks in addition to the old standbys like ice cream and candy. Silver Lake State Park now offers fresh tossed and chef salads, summer pasta, potato and tortellini salads and a variety of sandwiches and wraps all made next door at the Barnard General Store. You can also pick up a S'mores kit - complete with marshmallows, Hershey bars and graham crackers, so you can fix up some s'mores right on the spot. 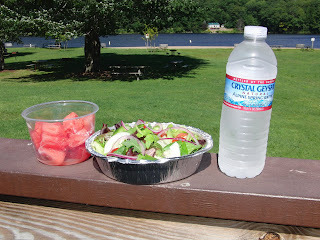 Camp Plymouth State Park has also added tossed salads, with or without grilled chicken, fresh watermelon cups and and healthy sandwiches. Both parks, still offer summer classics like ice cream sandwiches, fudge bars and choco-tacos.